I'm keen to hear from people that have upgraded from 100 to 200 Mbps plans - is there any noticeable difference in streaming, i.e. HD kicks in faster, buffering eliminated altogether? As a matter of interest, what kind of CPE are you planning to use on the 200Mb/s connection? Are you having issues on 100mbps? No issues - just keen to know at that level of speed if the gains are significant or not from a user perspective (streaming intl HD streams every night etc). CPE is a Mikrotik RB2011UiAS-2HnD-IN, with wired ethernet to my main TV. 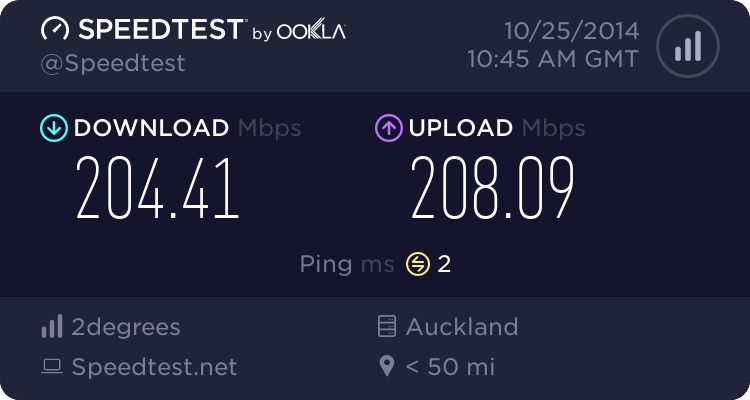 Main reason for asking is that BigPipe are now offering 200/200 in Wellington and i'll switch from my current ISP as long as it makes a difference. depends entirely on what you plan to do with your connection. Generally, more bandwidth is better than less bandwidth, but you do start getting into 'diminishing returns' territory where adding more makes such an imperceptible differences. at 200Mbps the most likely bottleneck will be your own equipment. i.e. your router, your PC, the write speed of your hard drive etc. The other potential bottleneck will be the servers you download from. Some servers simply don't allow you to download faster than XMbps no matter how fast your connection is. If you're the only user in your household, then you shouldn't see any difference in streaming stuff like Youtube, Lightbox, Netflix etc, since you should already have ample bandwidth to stream at the absolute best speed available at all times. If you have more users in your household, then sharing bandwidth has the potential to be a problem if you have lots of people all trying to watch or download stuff at the same time. 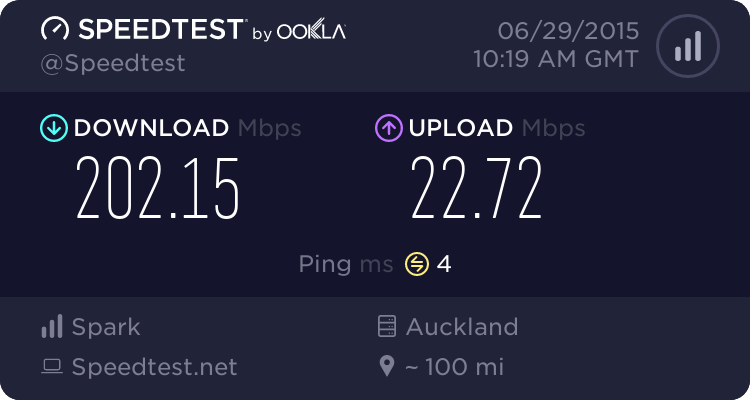 pedrogarcia: Main reason for asking is that BigPipe are now offering 200/200 in Wellington and i'll switch from my current ISP as long as it makes a difference. Only really makes a difference if your downloads/uploads can hit 200mbps~. I'd just move ISP anyway if it would be cheaper for you in the long run but if you or the people in your house can't max out a 100mbps connection I don't think it would make a difference. There really needs to be a push in ISP advertising to stop selling speed and start selling bandwidth. Joe Blogs still doesn't get that just because you've got a lot of Mbps you might not have a lot of speed, you can just do more things at once. If this factor was addressed in a public education drive it would take away so much pain for everyone, including ISPs that staff whole contact centres just to deal with (among other things) the question "why is my Facebook so slow if I have 100Mbps UFB?!" gehenna: There really needs to be a push in ISP advertising to stop selling speed and start selling bandwidth. Joe Blogs still doesn't get that just because you've got a lot of Mbps you might not have a lot of speed, you can just do more things at once. If this factor was addressed in a public education drive it would take away so much pain for everyone, including ISPs that staff whole contact centres just to deal with (among other things) the question "why is my Facebook so slow if I have 100Mbps UFB?!" As mentioned this will make a difference with anything thats downloading from multiple sources. That's multiple people using the connection, multi threaded downloads, peer to peer etc. Single threaded downloads, unless hitting a cache don't tend to break 100mbps i find. Kindles hurt when that happens. What is your current upload speed? As if it is only 20mbit then a faster plan will be worthwhile only if you get a faster upload also. Not really much point in my opinion. Its all about gamers and bragging rights. The typical point of attrition where you get diminishing returns for the http protocol these days is about 6 megabits. 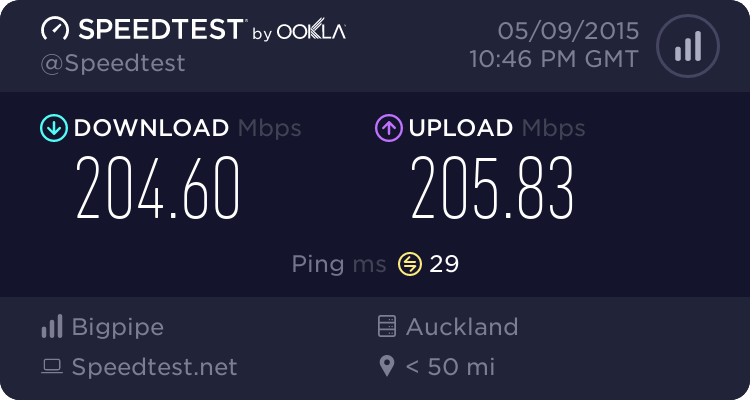 Anything above 6 megabits is not going to make trademe or the nz herald run any faster because ping times and multiple http requests / browser performance are the bottleneck. But with youtube and streaming video, you wont notice any difference above 20mbits. Personally in my testing, youtube performs no better at 12mbits over 8mbits, but i havent tested netflix or anything 4k yet. An HD 1080p youtube video is 6mbits - so 8mbits will allow the initial burst before the youtube player slows itself down to only buffering at playback speed. If you have four people in the household, then 30mbits is plenty in my opinion. Beyond that its bragging rights as stated above. When you say 30mbits is plenty, have you compared 30 to 100? and what plan are you on?